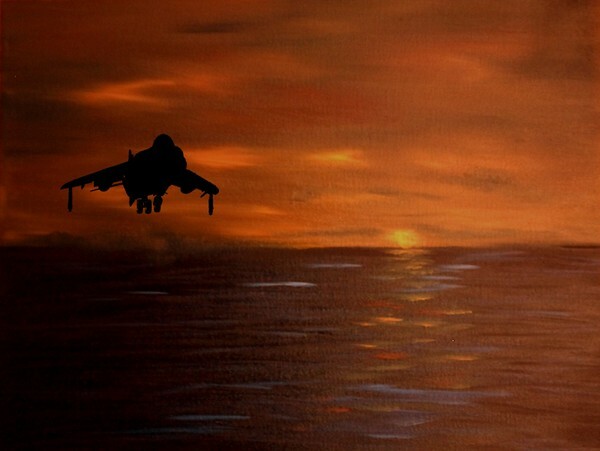 Latest in the "Sunset/Sunrise" painting series, depicts a Royal Navy Sea Harrier on approach to a carrier. All in oils on 12" x 10" stretched canvas. Wonderful job on the sky and water. The Harrier is an amazing surprise. Incredible really. Oh, yes! I really like this one, the sky and water simply leave me speechless, thanks for sharing this amazing work of art. Beautiful. The detail of the Harrier is spot on, including the air turbulence below the fuselage. Could see a large lithograph of this hanging in the officers' dining room or lounge. Very nicely done. Artist Reply: Thanks Mike, I enjoyed doing this one...such a shame we retired the SHAR from Royal Navy duties!